Technically, it was a terrible show: But 200 people never had more fun at the Star Community Bar. 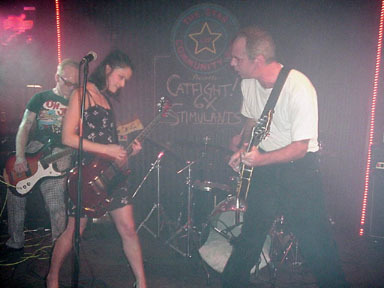 The Stimulants, 6X, and Catfight! almost maxxed out the capacity of the place for a rockin' night of music. Sure, they forget their lyrics, and the drum broke, and the tuner blew, and they often had to stop because they were laughing too hard, and we can't over look Lara bleeding from the head, but it was outstanding music and we were laughing right along with them! Wow, what a show! Playing second, the meat of the Rock & Roll sandwich, was the band I came to see: 6X. I think they're incredible: And I can't be too far off, because they are/were the featured band for Stomp and Stammer's August issue. I first saw them last year at The Point with the Mouth Breathers and fell in love. I saw them again at The Point for the Kung Pow CD release party. Everyone was nice enough to sign my CD. It was a great show. This show was more of a party than usual. I don't know why, maybe it was the alcohol, but everyone was just being really happy and really silly. Of course that's usually a recipe for disaster and sure enough it happened. Right off the start, Kevin smacked Lara Kiang in the head with his guitar. But that didn't dampen the mood, it just made her more feisty, if that's possible. The show must go on! She kept checking her forehead for blood and tormenting Kevin all night. Some others got into the act too. I suppose I was a witness to Rock-History. Lara kept pointing to her forehead, and others in the front row would imitate her until Kevin had to turn around in shame. Typical for Kevin Rej he practiced thanking all those cities he hopes to play in someday. Thank-you Cleveland, etc... I'm not sure I get this joke, but I'm getting used to it and almost look forward to it each show. He also wore his rock-star rose sun glasses, at 1am, and did all the show-off guitar moves and poses. I suppose I could have photo-documented that - maybe next time. If you're a big fan of his, drop me a note and maybe I'll show you a couple of other pix. Except for a slight concussion, Lara was having a wonderful time. She was singing loud and really driving the crowd into a frenzy. The members of Catfight! were in the front row with some of Lara's friends and were they having a party! Jumping around, singing along, bouncing up and down. The happiness was totally contagious. Have you seen her awesome tattoo? I exchanged E-mail with Lara earlier in the week to make sure it was okay to take pictures. I also checked with Rob before the show. I guess she didn't mention it to anyone because her friend Kim asked me about it. Rob Gal was having a little trouble with the heat. I thought he was going to drown us. Maybe that's why he wasn't having as much fun as the rest of us. Questions, comments, and corrections always welcome. Don't steal my pictures without asking first! People who steal pix are slime!